PUBG’s snow map has been revealed. An enormous datamine has revealed an overview of the map, as well as a bunch of other files which hint at new weapons and features, as well as brand-new vehicle. The new map looks as though it will be called Dihor Otok. To me, that suggests a pseudo-Himalayan setting, which would fit with what looks like a particularly mountainous map. In terms of size, Dihor Otok is actually a little on the small size. Technically, it’s billed as the same size as the 8x8km Erangel and Miramar, but players have been quick to point out that those maps are significantly bigger than the new addition. It’ll be bigger than Sanhok, sure, but looks to offer something of a middle-ground, rather than a third full-size option. As well as having plenty in terms of mountainous settlements, the new map has a lot of coastal points of interest, particularly dotted along its northern shore. Coupled with the river and river running through the centre of the island, it seems that boats could be pretty important in Dihor Otok. You can get a full look at the map via this collection of dataminer’s screenshots. Interestingly, the new location isn’t all snow and ice. While the northern part of the map is almost all covered in snow, most of the south is pretty green. That means that while you might be able to track other players in the north, if they flee south you’ll likely lose the trail. That north/south divide also seems to mean that the river is frozen over in some places, but not in others, which could result in some interesting car chases. As well as the map, those files offer evidence of a ‘Night Mode’, with a separate set of files pointing towards specific night-time weather. There’s also something referring to a ‘squall’, a slightly archaic word for a sudden, localised storm, which could suggest that dynamic weather events could be heading to the game. There are also plenty of cool Points of Interest mentioned in various files, pointing players towards a castle, a maze, and something called the Cosmodrome. On top of that, there’s now C4, to help you set up some elaborate traps, and a new vehicle clearly inspired by the classic Volkswagen Beetle. 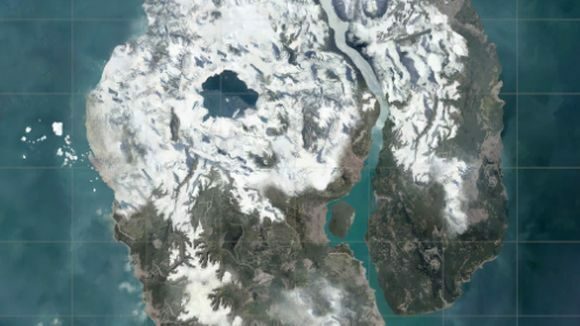 The PUBG snow map is set to arrive this winter, although we don’t yet have a concrete date. What we do know, however, is that the new map is likely to show up on the test servers in the not too distant future, so keep an eye out for an early chance to play.